Fig. 5. Probability of extinction of the greater glider within the Karawatha and Kuraby metapopulation under different catastrophe scenarios. 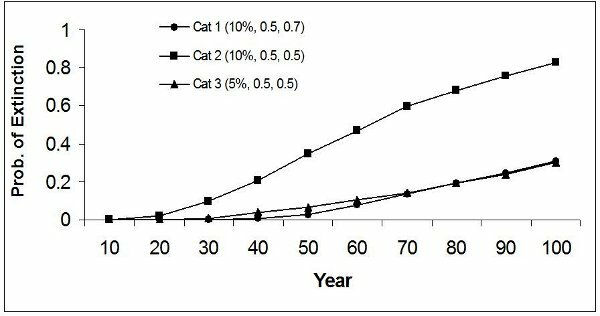 Catastrophes have three attributes: a frequency (annual probability of 5%–10%), and an influence on the proportion of females breeding (0.5), and proportion of individuals surviving (0.5–0.7). We modeled three types of catastrophes (cat. 1–3), which comprise different values of these attributes.